WILLS POINT, Texas, Sept. 4, 2018 /Christian Newswire/ -- More than seven years after the United Nations formally called attention to the plight of widows, millions of bereaved women still find themselves subjected to abuse, humiliation, ostracism and poverty, according to a major new report published by GFA (Gospel For Asia, www.gfa.org). Photo: GFA (Gospel for Asia) provides healthcare, vocational training and spiritual care to some of South Asia's millions of widows, many of whom are left destitute because of cultural prejudices. "Widowhood: The Worst That Can Happen" (www.gfa.org/special-report/widows-worldwide-face-tragedy-discrimination) cites estimates of 285 million widows worldwide, with more than 115 million living in abject poverty. Cherie Blair, president of the UK-based Loomba Foundation, says 86 million have suffered physical abuse. Blair calls their plight one of the most important, yet under-reported, human rights issues facing the world. "Much has been made, and rightly so, of gender inequality, but widows have truly been at the bottom of the pile—visible and invisible—for too long," Blair commented in The Guardian. Released to build on awareness of the issue raised by the recent International Widows Day, the in-depth GFA article is the latest in a series of special reports addressing key global issues, intended to encourage action. The Wills Point, Texas-based organization has been actively involved in raising funds for job training, education and other assistance for the millions of widows living in Asia for many years. Partnering primarily with female missionaries, especially the specially-trained Sisters of Compassion, GFA has provided healthcare, education, job training, and other assistance to women across the continent. This has helped break the cycle of poverty, low-paying jobs, and societal and cultural discrimination that particularly affects widows. Too often, long-standing cultural traditions blame widows for their husband's death, which precedes violence, abuse and often a loss of inheritance rights. 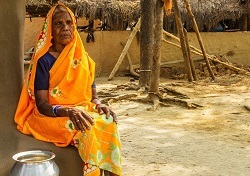 "For millions of widows in Asia, life is incredibly difficult," says Dr. K.P. Yohannan, founder of GFA. "Many are forced into begging or prostitution to survive. There are more than 46 million widows on the streets and in slums. There are stories of thousands of widows committing suicide because they have no hope." It isn't just widows in Asia who suffer from hopelessness and discrimination. Stories from Afghanistan, Nigeria, Nepal and many other places appear in the report, even the U.S. There, a recent Social Security Administration audit found that the agency had underpaid nearly $132 million to more than 9,200 widows age 70 or older because it failed to inform them of an option available to them when they filed for retirement benefits. The Loomba Foundation says that while much of the research and analysis regarding widows is not new, many people remain unfamiliar with it. That's because the evidence hasn't moved beyond academic journals, obscure books, and findings by international organizations, the foundation says in its latest Global Widows Report. The deprivation faced by widows "extends its destructive influence deep into the rest of society, and can be seen at work across large parts of the world," the report says. "Widows' deprivation is therefore not simply about identifying one more category of people to be added to the poverty policy list." "God judged Israel because they did not care for the poor and suffering," he says. "The body of Christ is responsible to care for them. We must do everything we can to alleviate their pain and suffering. The only hope is to let them know there is a God who loves them and sees their tears."